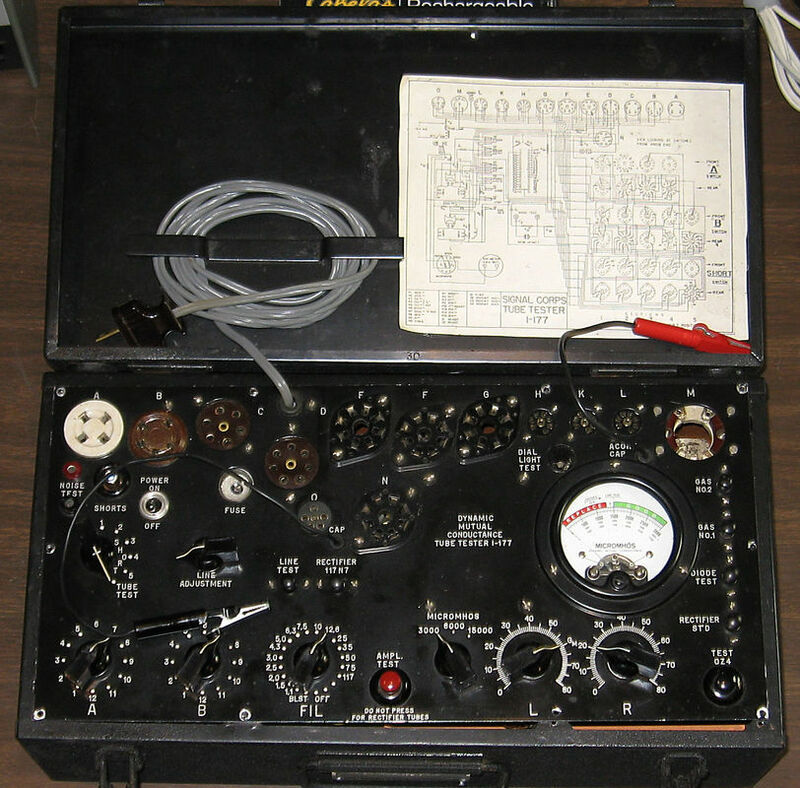 The I-177 is a World War II era mutual conductance tube tester capable of checking older 4-pin on up to 7-pin miniature tubes. It does not check 9-pin NOVAL or newer tubes without an add-on MX-949A/U adapter. The MX-949 can be hard to find but it's also possible to build an adapter box if needed. However, even with the adapter the I-177 may not properly test some newer tubes because it uses a 5-volt AC grid signal, too high for some tubes. As a comparison, in a TV-7 tester the grid signal varies from 5-volts down to 0.5-volts, depending on the range selected. This I-177 is a little different from most: it was actually made in Germany after the war and has a slightly different layout of the front panel compared to an American-made unit. It's in a wrinkle-finish black metal cabinet that's stenciled with "2161 COMM, MARS, CAT 3 " which, according to web, was the 2161st Communications Squadron at RAF Greenham Common in Berkshire, England. 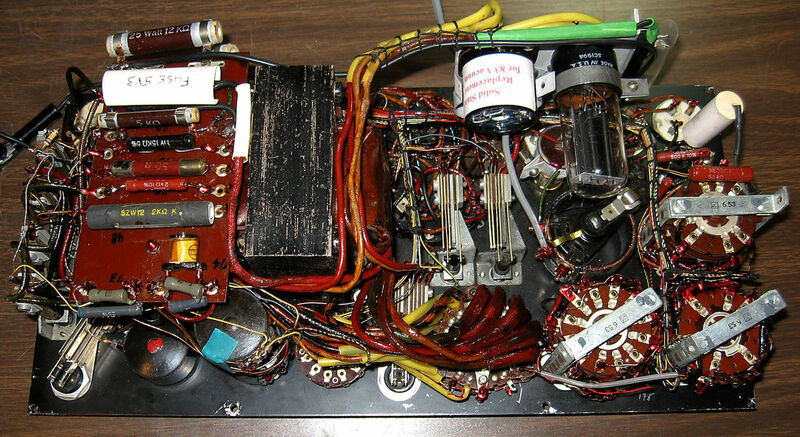 The layout of components on the front panel has been slightly rearranged. 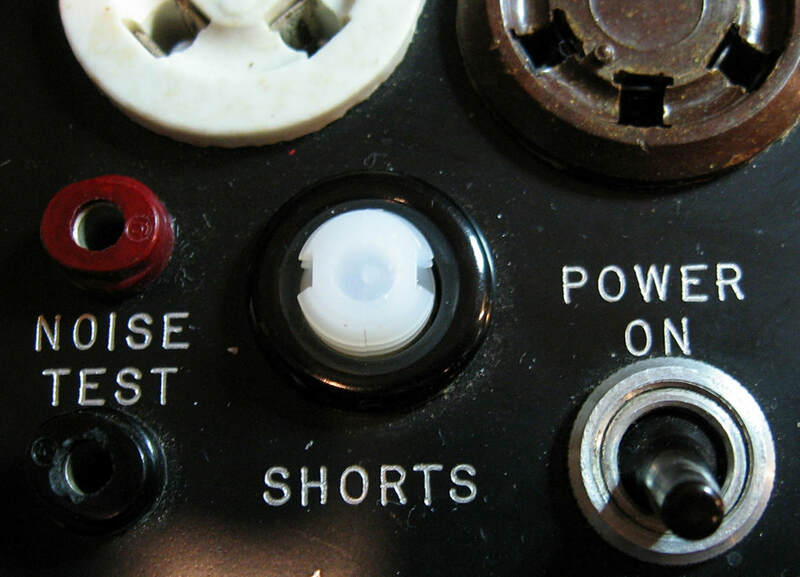 The power cord hole has moved causing the D socket to be shifted down, the "N" and "O" sockets have been moved up closer to the other sockets, the "Rectifier STD" test button is now inline with the other test buttons on the right side, which were shifted up, and the "Micromhos switch has been moved up inline with the "L" and "R" controls. 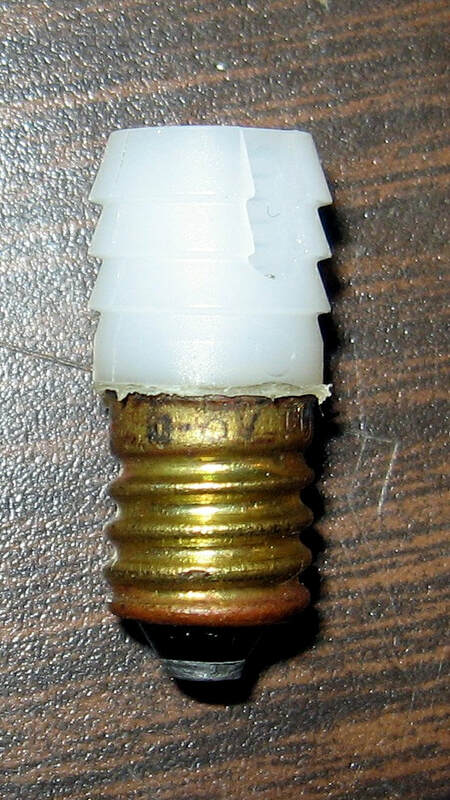 Also the hole for the "Acorn Cap" lead was moved down to just above the meter. There is also a separate lamp test socket instead of one integrated into Socket D as on the American-made testers. There are calibration procedure available online for the I-177 and I noticed a comment in them stating that the L and R controls go to 82 vice 80 and people claiming otherwise were in error. The later "B" models do have tick marks past 80 on the two control dials but as seen in these photos this model does not. The controls do turn a bit past 80, but it's not marked on the dials. 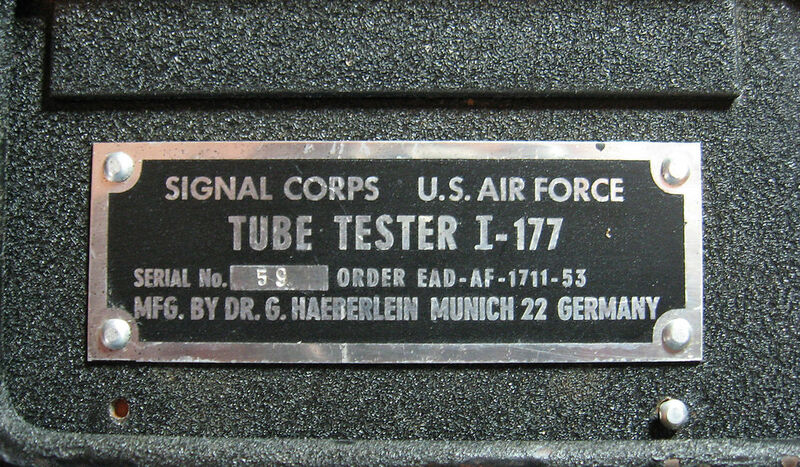 The tag says this I-177 was manufactured in Munich, Germany for the U.S. Air Force, which wasn't created as a separate branch until 1947. The last two digits of the order number are 53, which I think is the year of the order, so these testers were still in service and being produced right through the Korean War. As far as problems, the tester's in good shape internally except the zinc coated hardware and control shafts had a lot of oxidation buildup. The shafts of the stacked L pots could not be rotated even using a pair of pliers. Dexoit, contact cleaner and Superlube freed them up. All the switches were also given the Deoxit treatment and then washed down with no residue contact cleaner. Other issues included several cracked chicken head knobs which were repaired with super glue. And someone had added or replaced several resistors that were poorly soldered, so they'll have to be cleaned up, replaced or removed as needed. I also replaced a broken alligator clip and clip lead, and added a heatshrink sleeve over an internal wire with worn off insulation. Of course the one expensive tube in the set, the type 83 mercury vapor rectifier, was missing and had been replaced with a cheaper type 80 vacuum rectifier. I installed an 83 solid state replacement in lieu of a real 83 tube and added a fuse to the B+ line. The replacement tube uses zener diodes to duplicate the voltage drop of the mercury vapor tube and so far works just fine in circuit. 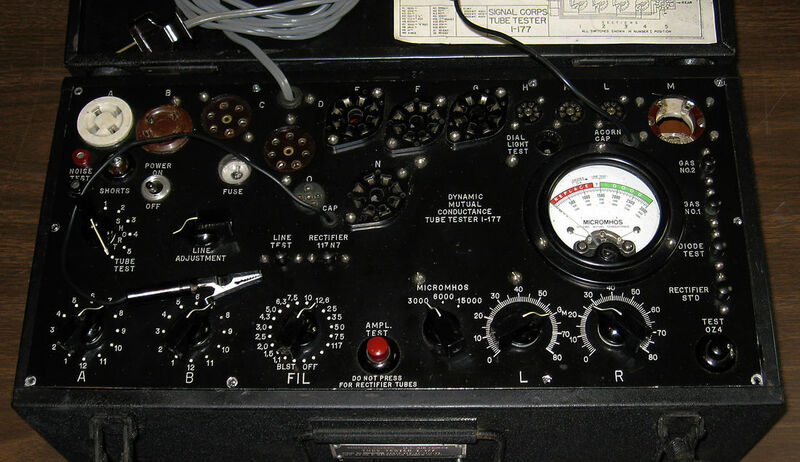 The solid state tube also eliminates 15-watts of heat that would have been generated by a real 83 inside the closed up cabinet, and it helps the tester hold calibration longer. 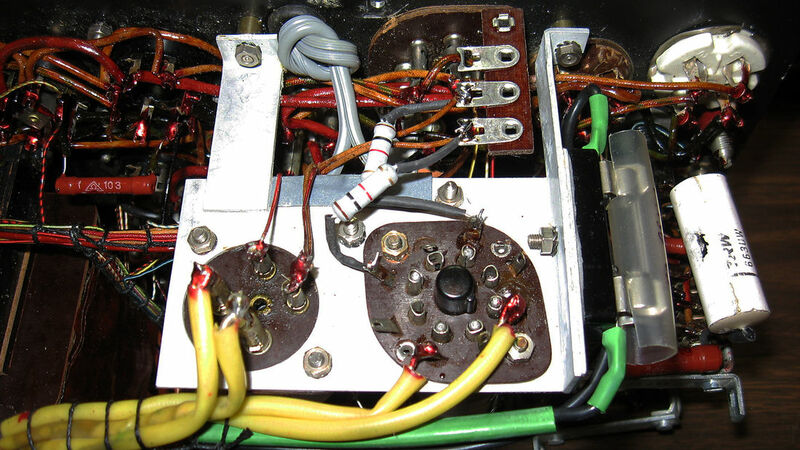 The added fuse protects the high voltage transformer winding for the plate voltage against the remote possibility of a diode ever shorting in the solid state tube. I also fused the 5Y3 high voltage output for the grid bias and screen voltage: I figured if I was fusing one transformer high voltage winding then I might as well fuse both. When I started calibrating the unit I discovered the Bias and Screen Grid voltage supplied by the 5Y3 rectifier was around 150VDC instead of the expected 130VDC. At first I thought it might be because I used a solid state 83 and it wasn't loading the transformer enough, but installing a real #83 did nothing to correct the over-voltage. ​I also have a Hickok 550X tube checker which is basically the same circuit so I opened it up and compared voltages. The 550X was right at 130-volts DC as expected, but when comparing the AC voltages on the 5Y3 plates I discovered that the I-177 was putting out 365VAC compared to 335VAC from the 550X, even when using a real 83 rectifier in the I-177. There doesn't appear to be any fault in the I-177 and I can only surmise the transformer was made this way. To get the tester to calibrate according to the online procedure I added 1K ohm resistors in series with the 5Y3 plates which corrected the bias voltage to 134VDC. That's as close to 130V as I could get and still keep the "R" pot's range correct. Some resistor values were changed in the past causing more calibration issues. Perhaps whoever put the #80 rectifier in place of the #83 was trying to correct the calibration. Whatever the reason, I'll need to replace resistors #40, #42 and #48 to put things back to original. Setting the Line Adjustment for 150VDC plate voltage caused the meter's needle to move slightly off the calibration mark making it necessary to adjust the value of the meter shunt resistor #74. And there is a mistake in Figure 9 of the original manual on page 15 where the labels for resistors #73 and #74 are reversed, so I labeled the resistors on the terminal board to avoid mistakenly trying to adjust the value of the wrong resistor. 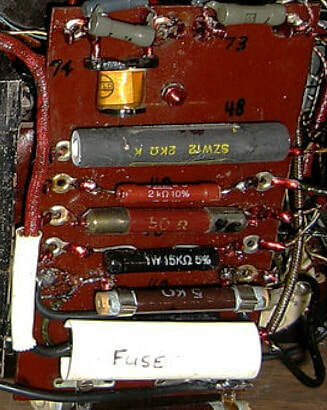 The fuse added to the 5Y3 rectifier high voltage circuit is at the bottom. This is actually placed in the center-tap line of the tube's 5VAC filament winding which is the high voltage output from the rectifier. The Shorts test circuit was not working and the problem turned out to be the original neon lamp. Regardless of what the manual says about neon lamps lasting forever, they do age. The replacement is made from a screw base with an NE-2 lamp soldered inside. The plastic "bulb" is a nylon dowel insert from the local hardware store which is hot glued in place. Just a quick and cheap way to replace the lamp without paying through the nose for a new one online. After reading through calibration instructions for a couple of different Hickok testers it appears that to get accurate Gm results the resistance of the twin "L" pots need to track each other very closely. The "L" pots in this tester are much easier to adjust than most Hickoks, as these are two separate pots ganged together and locked with a set screw. After unsoldering the connections to the pots so I could read the resistance accurately, I see the two pots are not exactly the same value. Although both pots are labeled 200 ohms the rear pot measures 217 ohms and the front pot 196 ohms, so no matter how much I try to physically adjust the pot orientation they're not going to match end-to-end. So I set both pots for zero, tightened the set screw and then trimmed the 217 ohm pot to read 196 ohms by paralleling a resistor across it. It seems to work and the results from testing a new 6L6 reads high on the Green quality scale and 5500+ micromhos on the Gm scale. But ​I won't really know for certain how accurate the readings are until I've finished building myself an Alternating Current Sink (ACS) test fixture for my TV-3 so I can calibrate it and then compare results with the I-177. I also want to do some testing to see if I can adapt the ACS to work on this tester. I've also noticed the meter needle vibrates on the 3000 Micromhos scale and sometimes slightly on the 6000 scale, but not on the 15000 scale. I'm still checking into why this is and I've read this is sometimes a problem in other Hickok testers but haven't seen anything referencing an I-177. The first time through the calibration, the instructions helped identify problems areas and helped me understand the circuitry. After all the issues were taken care of a second calibration was done to confirm the tester's voltages are in spec. On a side note, working on this tester and comparing test results between it, my Hickok 550X and my Precision 10-12 has identified an issue with the 550X reading low. Now I've got to fix it.